Zoolz can backup your laptop, external, network and hard drive. 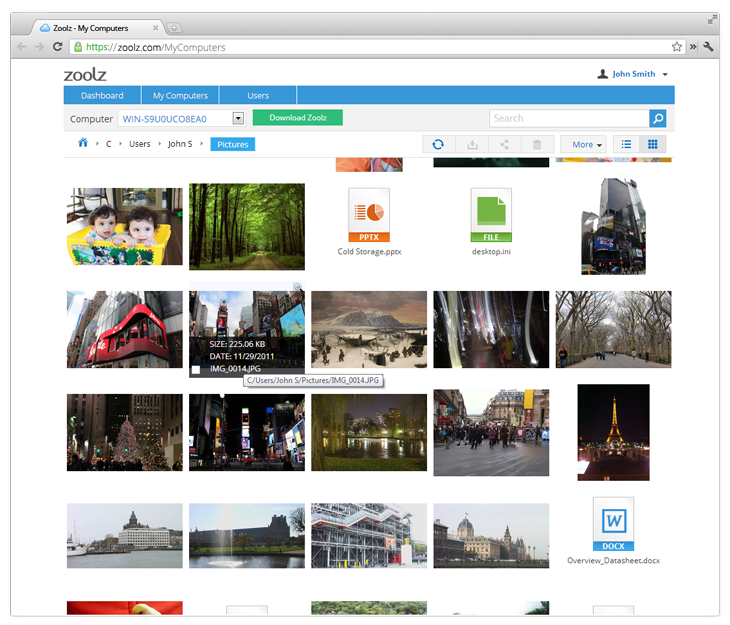 This means all your photos, videos and personal documents are securely protected. Never worry about losing a memory. Before files leave your device, it’s encrypted. Once on our servers, the data is then protected with military-grade encryption. You heard us right. Zoolz is the only provider offering 100 GB for life! That means your digital life remains backed up forever. Simplicity at its finest. You don’t need to be an IT wizard to use Zoolz. The intuitive system is easy to pick up. If you need any help, we have a dedicated team. 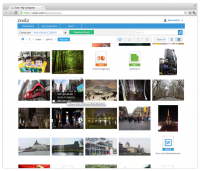 Zoolz is a market leading provider of cloud based storage. Our mission is to provide an affordable and secure cloud solution for users. Our innovative platform is made with you in mind. The user experience is focused on simplicity. But that’s not all, in just a few clicks, you secure all your critical data with military-grade encryption. That’s why more than 3 million users across the world count on Zoolz. I loaded this on a test machine and boy am I glad I tried it there first. This software and service gas no business being on a machine that contains anything you don’t mind sharing with who knows who. Zoolz security and privacy are absolutely lacking. You have virtually no control over what it grabs off your machine unless you preempt it, which is not acceptable software behavior. It’s fails as a cloud drive, it’s only accessible from the web, that’s pretty limited use. So i contacted zoolz after getting this and gave my account info to thier customer support. They said i do have 100gb for life. BUT they also said that if i was not to sign in for 30 days then everything will get deleted. only paid customers do not need to sign in every 30 days. > There does not seem to be a way to NOT automatically backup. You can select how often to do it, but it’s once a day minimum. You can’t open an account, install the software, explore it, learn it, then decide IF and WHEN you want to backup. > Just exploring the software risks launching the backup, unannounced. I checked one box in my file tree, just to see what it would do. The upload immediately started, without me confirming anything, or even having reached the end of the wizard. Just let it be known that I will never updload anything to the cloud without having encrypted it myself before, regardless of whether the service purports to encrypt the files or not. I immediately stopped the upload (fortunately, this was possible), and my dashboard shows 0 files uploaded. However, it does say that the backup was started, and the next one will occur in one hour. > Then I logged out, and tried to login again. Now, the service pretends my email or password is wrong, and won’t let me in again. So I can’t even delete my account. And theoretically, there might have been some ultra-confidential files already stolen from my computer and copied somewhere on the other side of the world. This might be linked to the fact that I have an ultra-strong password, with 40 characters and non-ANSI characters. It’s possible that the service accepts it in the first place, but then refuses it because it has understood it wrongly. It happened me before, with other websites. That’s unacceptable for a cloud service. > The only way to be sure no upload will occur again unless decided by ME is to uninstall the software. And that still does not mean some ultra-confidential data of mine has not already been irreversibly leaked to the world (even if the real chances of this having happened are very small). > All this means to me that whatever the seduction (free storage, beautiful interface), this service is an absolute no-no. It also explains why I, and other privacy-minded people, are extremely cloud-adverse. > When logging off from one place (browser tab, application), you don’t get unlogged from the other places which might be open on your PC (and usually are). A normally-behaved website will disconnect all your tabs as soon as you disconnect one of them. > I was able to reset my password just by requesting a reset link at my mail address. So, if someone knows my name is Kevin Smith, he can (presumably) guess my email is k.smith@gmail.com (or a few other alternatives), change my own password and hijack my account. Unless, presumably, I have set up a second password (called the encryption password) which cannot be recovered. But this feature is hidden, and it’s likely many people don’t bother to use it. Re: ” There does not seem to be a way to NOT automatically backup.” Then what you want is online STORAGE, like Dropbox. Online BACKUP is intended to be “set it and forget it”, the same as regular on-site backup software. Is it 100GB of Instant Storage, or 100GB of ‘Cold’ storage? I tried to get this offer, and it is only showing 50GB of Instant Storage and some 14 day trial. I am missing an Android App to sync files. It is inconvenient to logon via web interface, but all offered services are working through the webinterface. For users with a lot of data, single hard disk drive is sometimes not enough and fills up rapidly forcing the users to delete some data even when they don’t want to. Having more than one physical drives isn’t secure especially if you use it as external drive, it can be lost or stolen along with your data. That’s why everyone nowadays should be using some sort of cloud storage to save their important data. Cloud Storages are risk free (encrypted), and are accessible virtually anywhere around the world with help of the internet. Zoolz is a long term storage unit, specifically designed to secure and store all your data from external, internal and network drives. According to the developer, it is designed for storing your data on the cloud for a lifetime. Zoolz do not delete your files after a certain period of time, this means your hard drives may die but your data will always live on Zoolz cloud storage. The Windows installer is ~11MB in size, and the installation process is quick and straightforward. After installation, you need to login with your Zoolz account to be able to use the cloud storage. On the first run, you can straight away set up a back up and start uploading your data to the cloud. It lets you configure the options of your first back up, and guides you through each step to make it easier to understand. The Windows application of Zoolz is pretty straightforward and has a clean and user-friendly UI that is easy to understand. The application may seem to be very simple, but it does contain a lot of features and customization options especially designed for the advanced users. Zoolz application let’s you choose the type of data you want to back up, you can include/exclude different types of files from your backup. You can schedule the backup and set backup frequency to manually, hourly, daily, weekly, and every 5/15/30 min. Multi-threaded uploads can be turned on, this speeds up the upload rate but uses almost all of the bandwidth available. Although, you have the option to throttle the bandwidth and set a limit to bandwidth usage by the application. Moreover, you can allow Zoolz to only upload files on a certain type of network i.e WiFi, LAN, or 3G/4G. This feature allows you to back up your files to a hard drive on your server, network or an external drive on your PC in addition to your cloud drive. Users can control where the files are stored, and how much disk space Hybrid+ is allowed to use. If you have access to your Hybrid+ location you can restore you files faster and even without an internet connection. Zoolz is virtually accessible from any device with an internet connection, it has an application for Windows and Mac and also feature fully-functional applications for devices running iOS and Android. It supports almost all of the Windows versions (Windows 10/8/7/Vista/XP, Server 2003/2008/2012). Zoolz is definitely not recommended for people who restore there files a lot from the cloud storage. As it says on the developer’s site, Zoolz restore takes 3-5 hours to complete. But if you’re not into restoring files a lot, Zoolz is a great solution and most importantly the cheapest one around. Zoolz is a reliable and perfect solution for both individuals and companies that want to store huge amounts of data using the cloud platform. It contains numerous options and features to create backups without any difficulties. It is definitely recommended for people looking for cheap storage solution and do not care much about the restore speeds.